I think that we hear this story best if we begin with a bit of the background. After the crucifixion and resurrection of Jesus Christ, the Holy Spirit filled the Apostles with His holy breath on the Day of Pentecost, and the Apostles begin to preach the gospel publicly. And lots of people hear the Word and say, ‘what must we do to be saved?’ And within days, 3000 confess this crucified and risen Jesus to be none other than the Son of God and are CONVERTED through holy baptism. Most of those 3000 were Jews. And as you can imagine, their conversion doesn’t sit well with the Jewish leadership at all. And because the majority has always been able to make it pretty miserable for the minority when they want to, a persecution against the Jews who have become Christians breaks out. At that point the CONVERTED Jews, now Christians, flee Jerusalem to safer places. The city of Damascus to the south on the way to Egypt was one of those places. There have always been those who become convinced that persecution and the use of force is perfectly justifiable for the right cause. That’s what the practice of abortion is about. Saul was one of those. Luke writes that he was “breathing threats and murder against the disciples of the Lord.” And Saul did this in the name of the Lord. And his church, rather than confronting him and telling him to repent, actually gave him an official letter of permission and protection. “The Way” is the earliest name for the Christian Church before it was called Christian. This new religion was not a nationality or a race or a matter of ancestral blood lines but a life lived in the Way of Him who said, “I am the way and the truth and the life.” And those were belonged “the Way” understood that the Way of Jesus was always the way of the cross and NOT the way of power or force. As these holy Crusaders draw near to Damascus, suddenly, a light brighter than the sun at noon exploded in front of them and kept on flashing. All fall to the ground in fear. But instead of a mighty clap of thunder, there was a voice that asked the most startling question – “Saul, Saul, why are you persecuting Me?” And with that, Saul is met by the God whom he worshipped by NEVER KNEW. The origins of Paul’s doctrine that the Church as the very body of Christ is rooted right here. “Now you are the body of Christ and individually members of it,” he later writes to the Corinthians. (1Cor. 12:27) And to the Ephesians he writes, “And He put all things under His feet and gave him as head over all things to the church, which is his body, the fullness of him who fills all in all.” (Eph. 1:22f). In a case of divine irony that must have had the angels rolling with laughter, Saul’s word of life and salvation through the forgiveness of all of his sins – WHICH ARE GREAT – comes through the very church that he was trying to eliminate. Saul must hear this word that alone will set free, from a man from the city of Damascus named Ananias who was certainly one of those whom he had set out to arrest. Saul’s sight is restored ONLY as he hears Jesus speaking THROUGH His church, and not apart from it. Saul’s sins are forgiven ONLY as he submits to the sacramental means of grace and is baptized, and not apart from baptism. Saul is strengthened for what is to follow ONLY as he takes and eats the food that strengthens the follower of Jesus to walk in His Way, which is always the way of the cross. And we certainly share in their amazement. Here is a stunning example of the truth that “as the heavens are higher than the earth, so are God’s ways higher than our ways and His thoughts than our thoughts.” (Is. 55:9) For the most important jobs that need to be done, we search out the most qualified candidates and carry out our background checks and weed out all fall short. We certainly don’t try to recruit those who want to tear down and destroy the work that we are to do. We find that which is lovely and agreeable and this is what we love and agree with. But not God. He CONVERTS what is terrible and against Him and makes it lovely and His disciple. Paul is thinking of the prophet Jeremiah, whom the Lord called saying, “Before I formed you in the womb I knew you, and before you were born I consecrated you; I appointed you a prophet to the nations.” (Jer. 1:5) Paul now hears those words as God’s word to him. And there’s no question but that we should hear them as spoken to us too. From the moment of conception, we are known by God and called by God who makes us His own and sets us apart – not based on our qualifications or performance or even our potential – but solely by grace. Not because we are lovely, but solely because He loves us, and no one is lovelier than the one who is loved by God. So as he tells his story, at no time does Paul say anything like, ‘when I decided to become a Christian,’ or ‘when I gave my life to Jesus.’ No its, “when He was pleased to reveal His Son to me.” Conversion is all God’s work. And all we can do is respond to His gracious love by saying ‘thank you’ and going to work. The work for Paul began with a retreat to Arabia, of which we told nothing, but it must have been a time of retreat in quiet prayer and devotion. For Paul, things have been turned completely backwards from what they had been. This new life would take some getting used to. 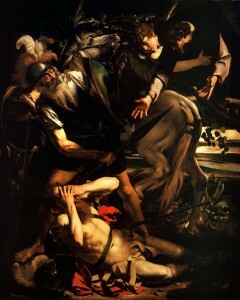 For his whole life, Paul had been ZEALOUSLY pursuing acceptance by God by striving to live up to the high expectations and demands of the “tradition of my fathers.” Maybe some of you know something about that kind of pursuit of acceptance by trying to live up to the expectations that others are always setting for you – and that keep on moving. This new life of being ‘pre-approved’ by God vs. the old life of ‘seeking approval’ by God takes a while to get used to. And maybe that’s why Paul needed some time in Arabia. And maybe that’s why we need to be here.